Скачать полную версию mp3 доступно после оплаты. Ссылка на скачивание появится здесь после оплаты. Возможность скачивать и просматривать все материалы в течении 1 недели. Возможность пользоватся всеми материалами сайта в течении 2 недель! Возможность пользоватся всеми материалами сайта в течении 1-го месяца! Next to the Summer Garden stretches the Field of Mars. 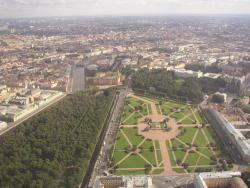 This square began to be called the Field of Mars between the 18th and 19th centuries. Mars was the Ro­man god of war. Till 1917, the Field of Mars was a place where soldiers trained and the military parades were held. At the time of Peter I holidays fireworks were held there. That’s why this place received the name of “Poteshny” (Amusing). Then it was named Big Meadow and later Tsaritsa’s Meadow. This place was called Tsaritsa’s Meadow because at that time there was a pal­ace for the tsaritsa Catherine I on the other side of the Moika. Between 1817 and 1820, after the design of Vasily Stasov barracks for the Pavlovsky Grena­dier Regiment were built there. This regiment was famous for its heroic feats during the war with Napo­leon. In the 20th century, the garden was laid here. The author of the project was the architect Ivan Fomin. In the centre of the field there is a Monument to the Re­volutionary Fighters. They were killed in February of 1917 and during the Civil War. In the northern part of the square near the Neva there is a monument to the great Russian military leader of the 18th century Alexander Suvorov. The monument was designed by the sculptor Mikhail Kozlovsky be­tween 1799 and 1801. This statue is one of the masterpieces of Russian monumental sculpture. The sculptor depicted the military genius of Suvorov, his courage and unbending will, Kozlovsky didn’t try to create a portrait likeness. On the round pedestal stands a young warrior in a helmet and armour with a drawn sword. The warrior is protecting the sacrificial altar. The Neapolital Sardinian Crown and the Pope’s tiara lie on this sacrificial altar. This allegory symbolizes the victo­ry of Russian armies gained under Suvorov. The Rus­sian armies defended Italy against the French forces. The sides of the sacrificial altar are decorated with the symbols of human goodness, faith, hope and charity. The granite pedestal of the monument was created by the architect Andrey Voronikhin. The pedestal is decorated with bronze bas-reliefs. These bas-reliefs are the allegorical depictions of Glory and Peace. There are crossed laurel branches and palm fronds above the in­scription “Prince of Italy Count Suvorov-Rymniksky, 1801s.” The height of the monument is 7.9 metres. In 1957, in the centre of the memorial the Eternal Fire was lit.